Texas Lawn and Garden Hour: This live Q&A program airs 11-noon every Saturday on a large list of stations. Neil takes call s from the Panhandle to the Valley and from the mountains of West Texas to the Piney Woods of East Texas. No matter where you live or whether your local station carries the program, give Neil a call at (888) 256-1080. 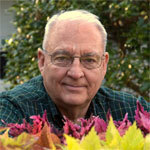 Plant Talk Texas: Neil Sperry began this program in 1978 and it continues today, being carried by several dozen stations across the state. It is a 5-minute daily weekday feature of interest to the gardeners of the Lone Star State. To date, more than 8,700 programs have aired.